BugE - More than a bike, less than a car: A revised dashboard and wiring harness. I decided to use the same wire color coding scheme as before will make future wiring expansion or troubleshooting easier. Although tempting, I decided against using a fancy fuse block. The wiring just isn't that hard to troubleshoot. Instead, I'm going to simply have inline fuses. DOT and NHTSA requires a motorcycle grade headlight (which must HAVE motorcycle markings on the lens) and turn signals in approved positions. So, the HI/LO headlight and turn signal wires need to be long enough to reach the front of the vehicle. Same with the ground wires. I'll be keeping the dual-navigator lights in the old positions on switched 12V just because I got-em. I really like the idea of being able to take the cowl off for servicing. So I'll be keeping the molex connector used between the cowl and chassis. I like having the speedometer (plus indicator lights) on the handlebars as well. 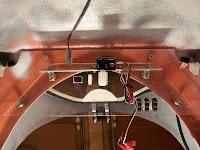 (the handlebar area includes brakes, throttle, speedometer and lighting controls) I probably could simplified the wiring a bit by putting this bit of instrumentation on the dashboard, but I think having the speedometer on the handlebars looks better. 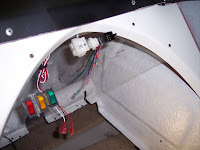 For now, I'll have molex connectors mounted in the dashboard for quick-disconnect but I may make an extension to the wiring so I can run them up the steering stalk instead of having wires going directly out the dashboard. I wanted to fit the dashboard in the area under the arch and have it be transparent so people can see roughly how the BugE is wired. However, when lifting the cowl, I usually grab this lip to lift it. That means the new dashboard will need to be mounted with screws so it can be detached on occasions when the cowl needs to be lifted off. I put in three accessory switches. One for fan, one for the old navigator lights and an accessory switch for future use. I also wanted to leave enough room for a future car radio. I also wanted to put in a "Signal Minder" type box rather than the plain turn signal relay that shipped with the kit. So, I added additional spade connector taps that the signal minder box would need. For now, I put in the retro 48V charge indicator behind the dashboard (rather, behind it which is one of the benefits to having a transparent dash). Eventually, I would like to get rid of that 70's looking thing and buy or build a circuit to allow the digital E-F indicator in the speedometer to represent electric capacity. A more secure key-switch to allow the lights to operate but not the main motor when the car is being shown at exhibits. First, I drew out a dashboard and marked with a ruler and sharp nail where material should be cut and removed. Then, I took out the Dremil tool and started cutting out material. Even though the material is inert, it's a good idea to wear a respirator for this since quite a bit of plastic dust is generated. Here, making sure the switches and Molex connectors are in the correct places before running the wires to them. The shelf is held on by 4 screws. It holds the dashboard plus an extra shelf attached to it out of "L" brackets. The shelf has additional holes drilled into it so zip ties can hang off of it. 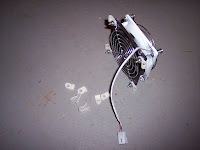 Next, I put on wire holders on the bottom of the fan so the new wire runs could neatly go along the top of the cowl if they were either going to the front, right or left on the car. To make wiring neater, I decided to add some wire wrap around the bundles. Then, I attached the front headlight using a long bolt and plastic pipe for a spacer then ran it's wires through the cowl. On the plastic pipe spacer, I put three large rubber grommets on the outside of it. They don't add anything structural but the grommets look better than simply a short piece of plastic pipe. Finally, bullet connectors were crimped on & the pins pushed into the molex connectors. During construction, I've found a world of difference between using a cheap crimp tool and a better one. I bought one for $30. It's worth it. I've saved time and money by not needing to redo crimps. The molex connector pin tool from Radio Shack at $7 is also kind of pricey but it allows fixing mistakes. Using solder & heat-shrink rather than tap connectors makes wiring look MUCH better. The K&S turn signal handle bar control has a special 9-pin connector on it. The connector is hard to find, hard to solder and it's expensive. If I was to do another vehicle, I would consider cutting it off and replacing it with a molex connector available at Radio Shack. 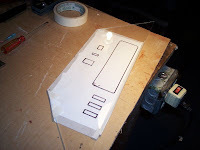 Dremil to cut the transparent dashboard from LEXANdoes work but doing so without scratching is tricky. I found a 12-pin connector between the cowl and the chassis is great for detaching the BugE when the cowl needed to be worked on. However, I found it would have been even better to use (3) 2-pin molex connectors instead of one big pin connector. That way, the connectors can pass through the small battery tray hole one at a time so the battery tray can be removed without cutting any wires. Also, the original side navigator lights needed to be taken off as well. Originally, my NYS-DOT caseworker said they were OK to leave on since non-dot lights are considered ornamental. Unfortunately, I didn't get that in writing. So, during my next correspondence, he insisted the sidelights also needed to be removed. To cover up the hole locations, I used amber reflectors.